Contingent musings on innovation, operations, change, and the world of management education. But how should managers monitor, engage with and exploit the activities and content generated by the different sites that make up this social media ecology? It depends!! I addressed this question in a recent paper, written with colleagues Jan Kietzmann, Kristopher Hermkens and Bruno Silvestre. 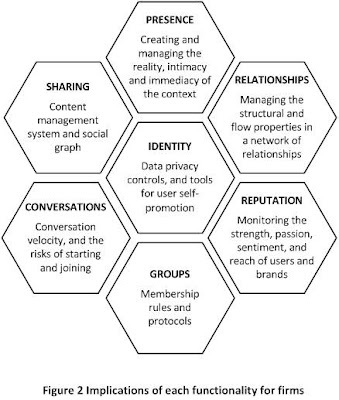 We present a honeycomb framework of seven social media building blocks -identity, conversations, sharing, presence, relationships, reputation, and groups (see Figure 1). 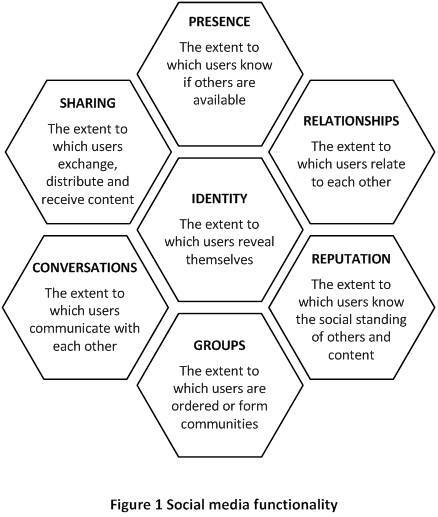 Each block of the framework allows you to unpack and examine a specific facet of social media user experience, and its implications for firms (see Figure 2). Utilized individually and together, these blocks can help managers to make sense of the social media ecology, and understand their audience and their engagement needs. 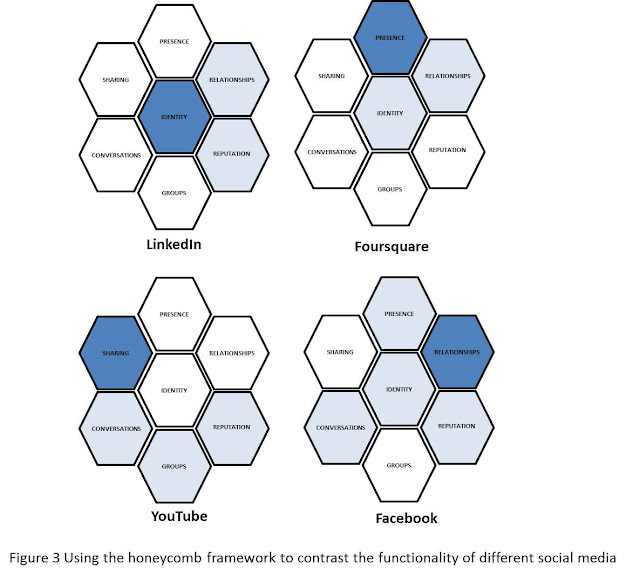 We explain how a firm can recognize and understand its social media landscape, using the honeycomb framework; develop strategies that are congruent with, or suited to, different social media functionalities and the goals of the firm; develop curating strategies for their own social media interactions and content; and finally use the honeycomb structure as a tool to evaluate the constantly changing social media activity. For example, consider how the activities and content of LinkedIn, Foursquare, YouTube, and Facebook all vary -the darker the color of a block, the greater this social media functionality is within the site (see Figure 3). 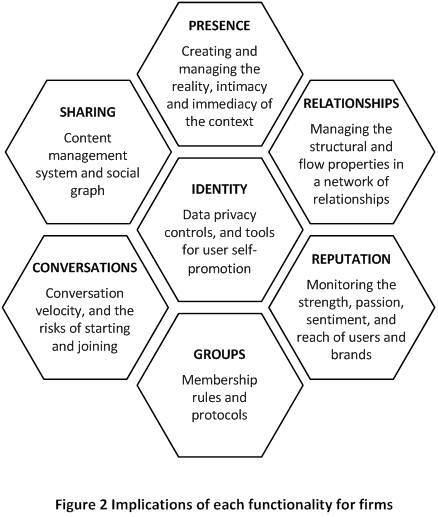 Firms interested in getting serious about social media can use the honeycomb framework to monitor and understand how social media activities vary in terms of function and impact, and to develop a congruent social media strategy based on the appropriate balance of building blocks for their community. Kietzmann, J.H., Hermkens, K., McCarthy, I.P., & Silvestre, B.S. 2011. Social Media? Get Serious! Understanding the Functional Building Blocks of Social Media. Business Horizons, 54, 241-251. Good Framework. Would surely like to see a case study on it. This is a beautiful way of describing a social network and how different organizations fit into the landscape, positioning them based on their centricities. Thanks! What do you think the honeycomb would look like for Twitter? Conversations and Sharing would be major functionalities. Very useful theoretical framework. Reminded me of an article I read sometime ago especially the ecology metaphor aspect. Do you have a case study example of a firm using the framework? strategy based on the appropriate balance of building blocks for their community. WOW Cathy, It's awesome diagram. I really impressive. "One single picture can able to speak thousands words", seriously this is the first thought on my mind while seeing these pictures. Very Nice. Social networking gives you the ability to learn about your customers. This gives you the opportunity to communicate with your potential customers and provide them with valuable information on a regular basis and more..Great sharing post.Thanks for this. I would like to use this framework to study about the social media using behavior in students but I don't have enough ideas to do a questionare TT_TT because some function can not use to some social media (I didn't separate platforms,I combined it all) such as if I would like to use for instagram . It' s very hard for me. However ,thanks so much for your framework. You described Social media very deeply,did a good job, i got too much knowledge about social media,thank you for sharing. I like the video better than the images you have used. Nice video Mc. We were assigned to read your excellent paper this week in a graduate course, which caused me to wonder if you have any updates you would like to make 6 years after the paper's original publication. Good luck with your graduate studies. Interesting article. However I am curious to know your views with regard to what changes would you suggest to the honeycomb model today? Are there any building blocks you think need to be removed? Added? Modified? Ian P. McCarthy. Simple theme. Powered by Blogger.